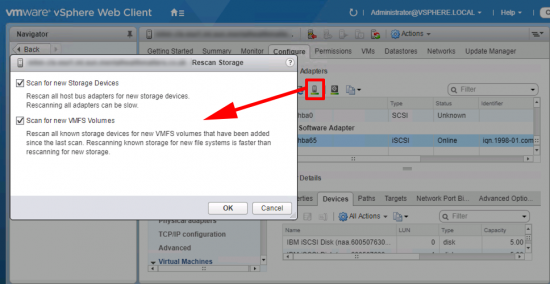 iSCSI storage is nice and cheap, so adding iSCSI storage to your virtual infrastructure is a common occurrence. I had to do this for a client this week to present an IBM Storagewize v3700 SAN into vSphere 6.5. It’s been so long, (i.e. back in the trusty FAT VMware client) that I did this so I thought I’d document it for next time. Add a Software iSCSI Adaptor: Select the host > Configure > Storage Adaptor > Add > Software iSCSI adaptor. After a few seconds you should see it appear at the bottom of the list. 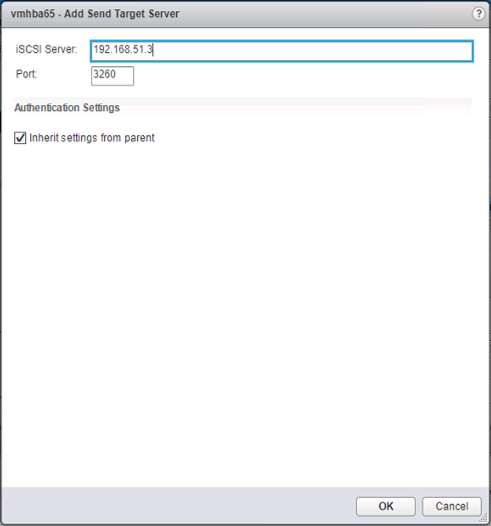 Create a vSwitch and VMKernel:If you already have this configured you can skip this section, but basically you need a vSwitch, with a VMKernel interface (that has an IP address on it that can ‘see’ your iSCSI device), and then you need to connect a physical NIC from that vSwitch the the iSCSI network (or VLAN). Note: You can add a port group to an existing switch, (or use a distributed switch!) Here I’m using a standard vSwitch and keeping my storage on it’s own vSwitch. With the host still selected > Configure > Virtual Switches > Add. 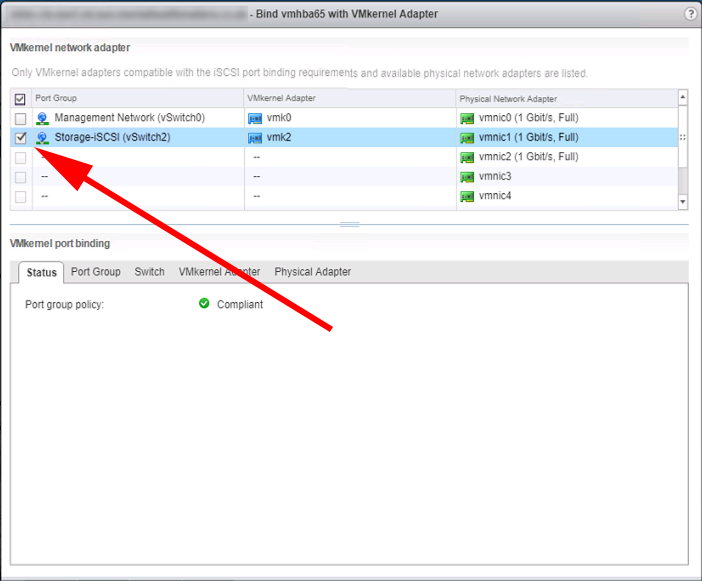 VMware Kernel Adaptor > Next > New Standard Switch > Next > Add in the Physical NIC tha’ts connected to your iSCSI network > Next. Give the VMKernel port a name (i.e. Storage-iSCSI) > Next > Put in the IP details* > Next > Finish. 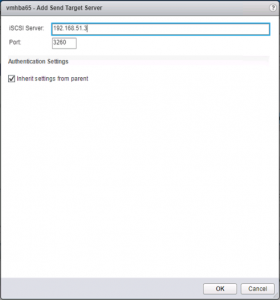 *Note: You may need to add a gateway if your iSCSI device is on another network. Jumbo Frames Warning: Edit the properties of the switch and set it’s MTU to 9000 to allow for jumbo frames. 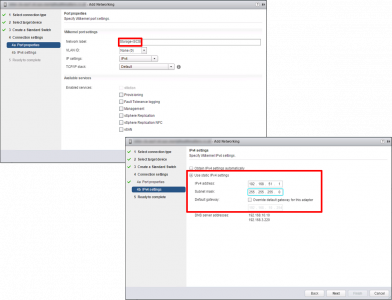 vSphere Configure iSCSI: Back on your vCenter, we need to ‘Bind’ the VMKernel port we created above, to out Software iSCSI adaptor. 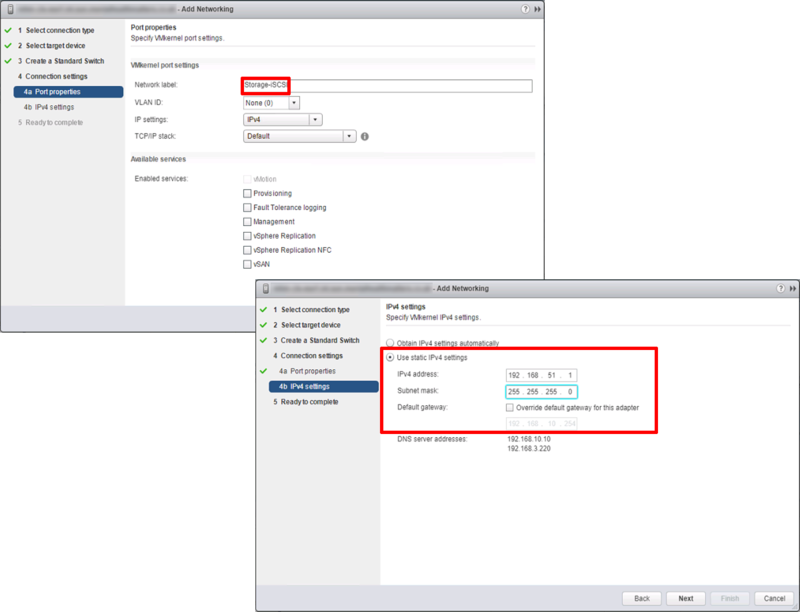 With the host selected > Configure > Storage Adaptors > Select the iSCSI Adaptor > Network Port Binding > Add. Select the VMKernel Port > OK. Note: If you can’t see/select anything, make sure each iSCSI port group is set to use ONLY ONE physical NIC, (i.e. move the others into ‘unused’). 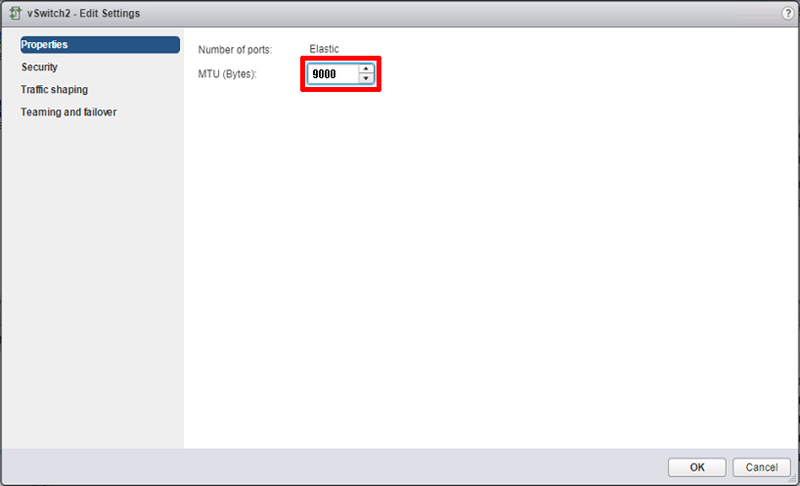 That’s on the port group properties NOT the failover priority of the vSwitch. 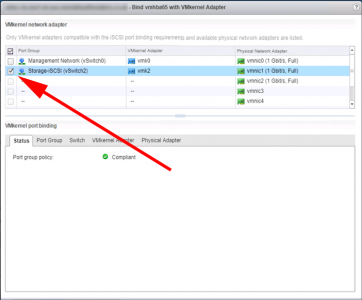 Add an iSCSI Target to vSphere: With the iSCSI Adaptor still selected > Targets Add. 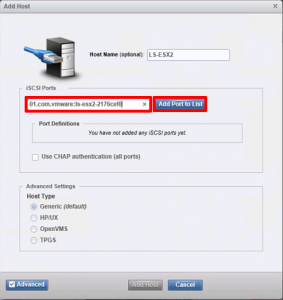 Give it the IP address of your iSCSI device. At this point, I would suggest you perform a ‘Storage Rescan’. Ensure ALL HOSTS, have had the same procedure carried out on them. 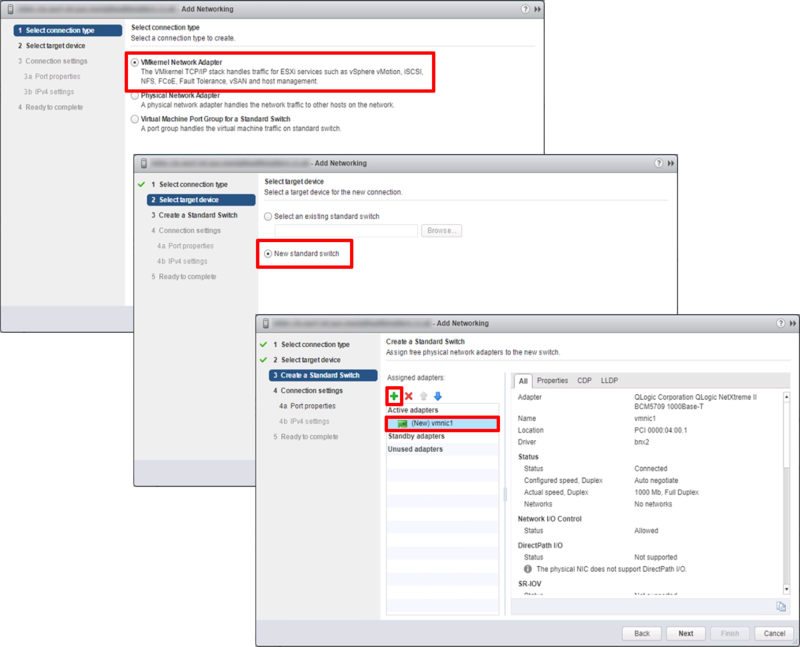 Then (assuming you have configured your iSCSI device), presented the storage, and allowed access to it from your ESX hosts. 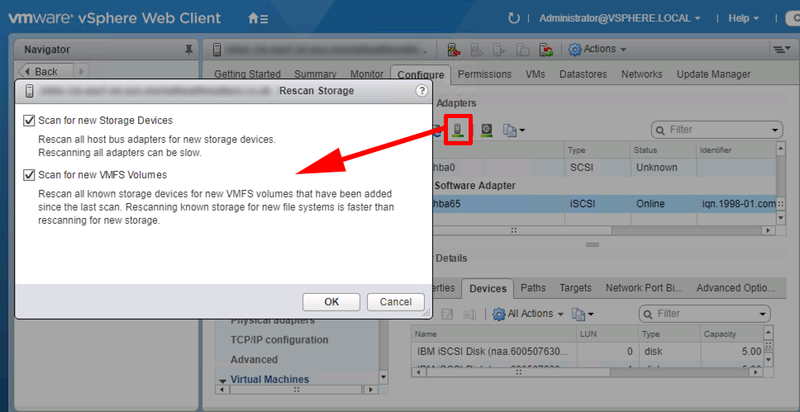 Right click the Cluster > Storage > New Datastore > Follow the instructions. 2. Create the Hosts (Note: you can copy the iqn in from vCenter). 3. Create MDiscs (RAID groups,) from the available disks, Note: Global Spares are allocated here. 4. Create a Pool, I dont really see the point of these, but you need one to create a volume. 5. Create the Volumes, which you will present to the Hosts, then create host mappings.